It all started in December of 2010. My brother-in-law has been brewing on and off for 5 years plus. He had a friend who was getting out of the homebrewing hobby, so he gave a lot of his equipment to my brother-in-law. Figuring that my 20-something year old son might enjoy brewing, my brother-in-law gifted it all to him (read us). For some reason, it took about a month or so before I came around to the idea of getting into brewing, but since it seemed cool to be able to say "I brew my own beer", and it gave me a hobby I could share with my son, I dove in. 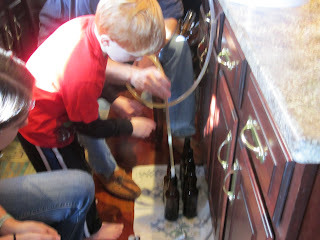 Over the following 9 months, my sons and I (the 20-something AND the little 5 year old) brewed at least 5 different kits, and with the help of Tom at Thirsty Brewer, developed several custom recipes as well. Truth be told, I was becoming the process guy, and my son was the brains behind the recipes. As my son was becoming more skilled at coming up with recipes, I was becoming more interested in saving money. With kits costing anywhere from $30-$50, when someone told me that All-Grain (AG) brewing would cut the cost in half, I instantly had a new goal: find a way to go AG! My issue with AG was that it seemed to be overly complicated, and honestly I was not sure at that point what mashing and sparging were all about. While surfing YouTube for instructional videos on brewing, I came across videos like this one that showed how easy it is to Brew in a Bag. I spent a lot of time on HomeBrewTalk.com, and biabrewer.info as well reading about BIAB. This looked like a winner to me, so the only question left was how could we put together a system at the lowest cost to be reliable and safe. I'll discuss details of that in my upcoming posts.